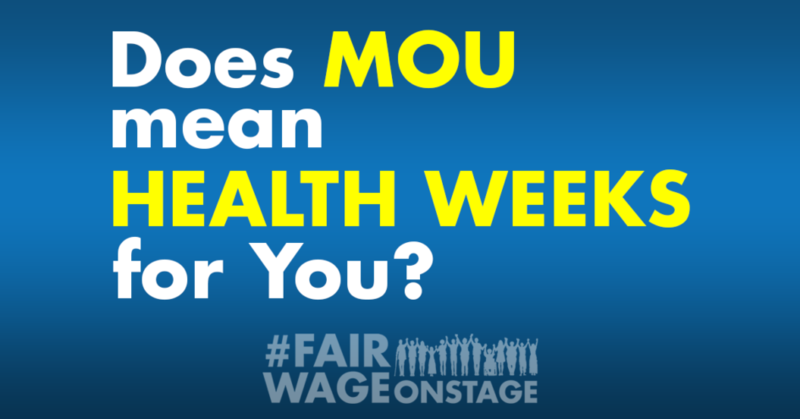 Does MOU mean Health Weeks for You? Guess what? Actors’ Equity members can get health and pension weeks for theater-related work that’s not on an Equity contract … or even in a theater. If you’re an AEA member and perform theater-related work like doing live industrials, corporate communications, or historical reenactments, or stage managing conferences or fashion shows, you can use something called the “Business Theatre & Events Memorandum of Understanding,” or “MOU” for short. Setting it up with the help of the Equity office will allow you to route your salary on those events (be they one-offs or continuous) through a third-party paymaster, which will do the paperwork, take out taxes and benefit contributions, and then send you your net salary. Read about the details of using the MOU here, then contact your Equity office business reps for more info. Whether this type of work is your regular bread and butter, or you just need that last week or two of benefits in order to qualify for health insurance through the union, using the MOU could make all the difference in the world.